I always love when people send me recipes, and when I received this one, I couldn't wait to try it. It comes to me from Missouri, specifically from Beck Zimmer's daughter's friend, Rita. (Did I get that right?? ah well, my apologies if I got it wrong!) Anyway, isn't it fun how recipes make the rounds and get passed from friend to friend to friend? I love that! And this one is so easy, you just throw everything into a bowl and mix it up. Simple! I made this cake for one of my Sunday dinners with Chris and Claire, and Chris said that this was the best cake I've made in a long time. It's now one of his all time favorites! I'll definitely be making it again soon. You should too! Oh, and don't forget to send me your favorite recipes. I love hearing from you!! Thanx guys! Add all together, mix well. 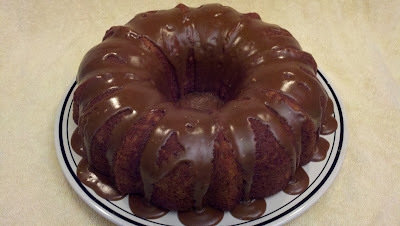 I use either 2 loaf pans or a typical cake pan, but bet it would be good in a bundt pan. Usually, I add mini chocolate chips and pecans just because I love both! To make buttermilk, add a tbs of lemon juice or vinegar to a cup of regular milk, and microwave for 30 seconds. The milk will curdle, which is exactly what you want! For a little extra flavor, try adding a teaspoon of rum extract. For the photo, I drizzled the cake with a brown sugar glaze, but you can frost the cake any way you like, or just simply dust with powdered sugar. Chocolate or peanut butter glaze would be yummy too!